I was in Cape Town a couple of weeks ago, visiting and talking to people in Geography at UCT and UWC and the African Centre for Cities at UCT – about urban things, related to the impending start of my Leverhulme fellowship on urban problematizations (as I’ve decided to start thinking about it). Inevitably, part of the trip involved bookshop ethnography – Cape Town has some great bookshops, in the sort of way that bookshops in other people’s country’s always seem exciting to academic visitors because, well, they tend to be full of local books difficult to find back home (or things you probably could if only you had noticed they had been published, like Gill Hart’s newish book Rethinking the South African Crisis). I was actually quite strong and did not buy too many – it was election week, so there were loads of new books on South African politics, including some excellent little books in the Jacana Pocket Series. One book I didn’t buy, but was given (Thankyou! 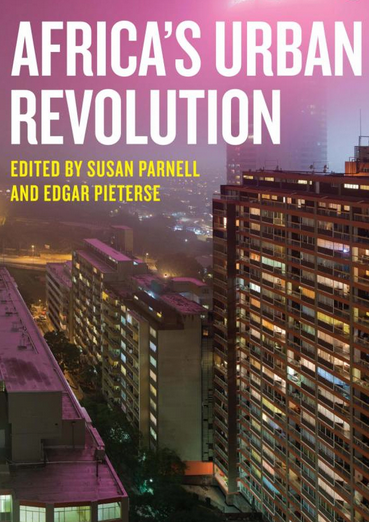 ), was a new collection edited by Sue Parnell and Edgar Pieterse, Africa’s Urban Revolution. It includes essays on a range of issues, from transport to violent conflict, religion to food security. There is lots of debate and discussion at the moment, in certain circles at least, about ‘southern theory’, southern epistemologies, ‘theorising from the global South’ (not least from this cluster of people – Sue is also co-editor, with Sophie Oldfield, of the new Routledge Handbook on Cities on the Global South). The collection is one element of a ‘knowledge experiment’, as Edgar has described it, based at the ACC to think through the distinctive, emergent politics of ‘southern urbanisms‘. This particular collection is notable because it is oriented to both academics and practitioners, an overlapping field of ‘thought’ that might be one the distinctive things about urban theorising from ‘the South’. It is not an example of ‘applied’ academic work, mind you – rather, it the essays demonstrate that key theoretical questions (just what is ‘urban’, or how does one conceptualise urbanization? ), normative issues (are ‘slums’ things to be eradicated, upgraded, integrated? ), and methodological dilemmas (what sorts of data are available about African urban processes, how reliable are they, what is their scope), are all central to contested practices of policy making, planning, design and management in African cities. I was struck in particular by the recurrent theme of data sources across the chapters – there is an interesting, if only implicit line running through the book that the politics of African urban life might be shaped in fundamental respects by what one might call a ‘governmentality deficit’, and in turn the sense that effective and accountable modes of surveillance (i.e. censuses, surveys, forecasts) might be central to the achievement of aims such as poverty alleviation, social justice, or substantive democratization. The editors note that this collection is a kind of companion a collection from last year, Rogue Urbanism –that’s a more arty, cultural-focussed collection, it has colour pictures; the two aspects of the work curated, shall we say, at ACC come together nicely in the magazine Cityscapes. Anyway, there is a launch event for the new collection next week, in Cape Town. I’m not going, I’m back in Swindon. But if you are interested in things urban, and in particular in ‘thinking problematically’, as somebody once said, about urban issues, then the portfolio of work coming out of the ACC node, or is it a nexus, is exemplary stuff. This entry was posted in Books, Geography, Social Science, South Africa and tagged Africa, African Centre for Cities, Cape Town, Edgar Pieterse, South Africa, Southern Theory, Sue Parnell, Urban Politics, Urban Studies, Urban Theory by Clive. Bookmark the permalink.